Most of the protesters in Spain are peaceful, but there is an increase in radicalization, especially among young people, which is understandable due to the high level of youth unemployment, trader and portfolio manager Felix Moreno told RT. On March 22, tens of thousands of Spaniards rallied in Madrid for a so-called ‘Dignity March’ against EU-imposed austerity measures. The protest was peaceful in general, though later on some protesters switched to violence, starting to throw stones and bottles at the large numbers of riot police and attacked cashpoints and hoardings. The main demands of the protesters are an end to the so-called Troika-style cuts in Spain, more jobs and affordable housing. RT:We've seen protests in Spain and other crisis-hit countries going on for years, yet nothing seems to change. So what's the point of anyone complaining? Felix Moreno: To perfectly honest, it’s necessary for people to speak out because the government has had it very easy so far. The previous government made such a mess of it. Most people had a lot of patience and hope that this command was going to change this direction. Unfortunately, they haven’t [anymore] and I think we are starting to see the beginnings of the sea change in public opinion against this government. RT:We've also seen a change in tactics as well. 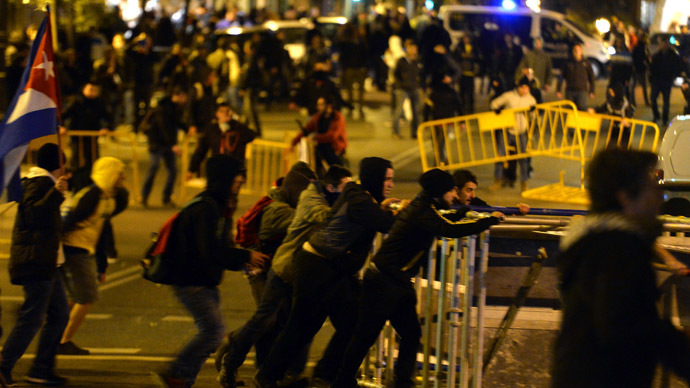 Last night in Madrid it was the police who received most of the injuries. Maybe there are some better ways for the people to get their voices heard than attacking the security forces? FM: [Almost] all of the protesters are peaceful, but there is an increase in radicalization, especially among the young people, and this is understandable. But hopefully the silent and peaceful majority will prevail. Even though the anger keeps some building up because as you said there is over 50 percent youth unemployment in Spain and those people are getting very angry. RT:The protesters are blaming the so-called Troika of the IMF, the European Central Bank and the EU for many of the country's problems. But isn't it really their own government that's landed them in this mess? Who is to be blamed? RT:Have these massive tax increases been advertised on the Spanish media? FM: The Spanish media has talked about it quite a bit but they have made much more noise about the cuts. In fact, that’s been three times as much revenue impact through tax increases than through cuts. RT:Of course, austerity takes its toll on ordinary people but what's the alternative to get out of the crisis? FM: Of course, the government's own economic experts came out with a report two years ago with real alternatives to it and then they did exactly the opposite of what they've actually published in their own books. What they said was “Two thirds of the cuts should be through reduction in government spending and privatization of the public companies and one third in tax increases.” They've done the exact opposite. They have increased VAT, which is a tax that most impacts the poorest, and they've cut spending in the most sensitive sectors. They have not reduced headcount in public, in government workers, they have not reduced spending of government companies and obviously they bailed out the banks. If they could have the money used to bail out the banks and used it to save the weakest in the population, the public unrest would have been much, much less, the situation would have been much easier. Obviously, they had to let banks fail to do that and they were ready to do that.